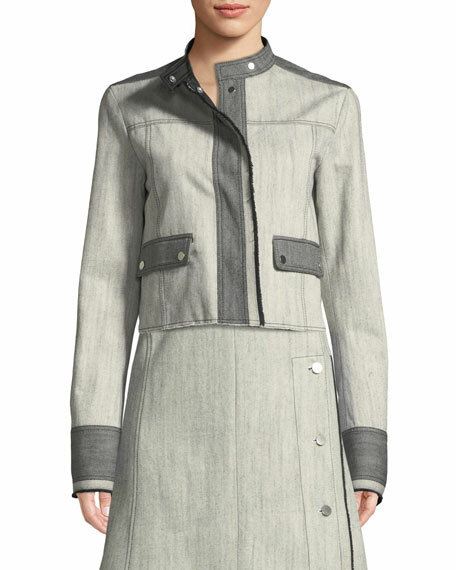 Derek Lam bicolor denim jacket. 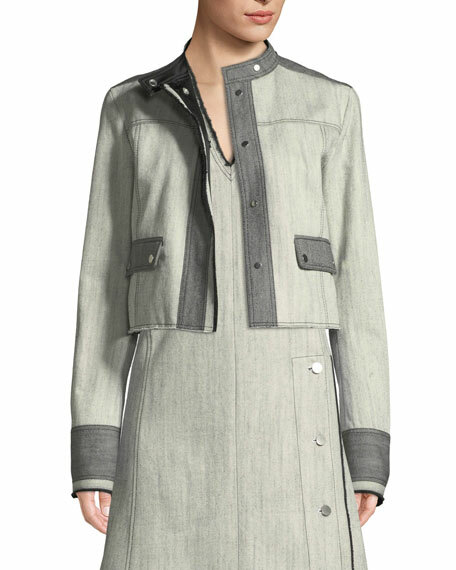 ALICE + OLIVIA JEANS "Rumor" jacket with hoodie underlay. 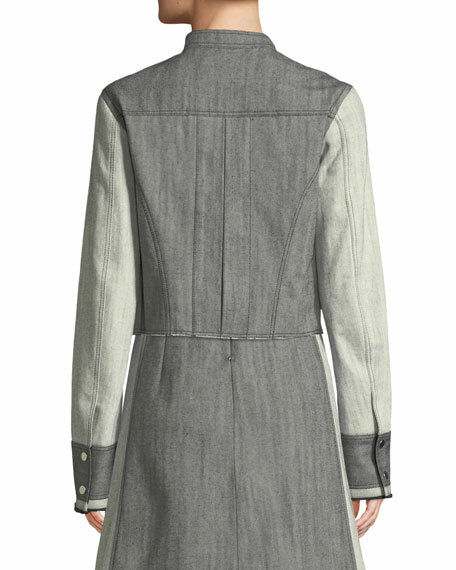 Hooded neckline; zip front with button placket. Long sleeves. Chest flap pockets. Relaxed fit. Cotton; merino wool combo. Imported. Model's measurements: Height 5'10"/177cm, bust 33"/84cm, waist 25.6"/65.2cm, hips 35.8"/91cm, dress size US 2-4/FR 34-36. Cushnie Et Ochs jacket in stretch-cady with contrast topstitching. Notched lapels; V neckline. Concealed closure. Slit, flare sleeves. Slim fit. Cushnie Et Ochs jacket in stretch-cady with contrast topstitching. Notched lapels; V neckline. Concealed closure. Slit, flare sleeves. Slim fit. Cropped at waist. Viscose/spandex. Lining, silk/spandex. Made in USA of Italian materials. Model's measurements: Height 5'11"/180cm, bust 33"/84cm, waist 24.5"/62cm, hips 34"/86cm, dress size US 2. Johanna Ortiz "Its All Good" jacket in deep-indigo denim. Double notched collars. Beaded embroidery at chest. Shoulder epaulettes. Long sleeves. Johanna Ortiz "Its All Good" jacket in deep-indigo denim. Double notched collars. Beaded embroidery at chest. Shoulder epaulettes. Long sleeves. Oversized fit. Cotton; lining, cotton/spandex. Made in Colombia. Model's measurements: Height 5'10.5"/179cm, bust 32"/82cm, waist 23.5"/60cm, hips 34.5"/88cm, dress size US 2.